next to normal wowed our audiences! We had a great run with our recent production of next to normal. This exciting & emotional musical wowed our audiences with power of the story & strong performances by our tight-knit cast, orchestra and technical team. With book & Lyrics by Brian Yorkey & music by Tom Kitt, this show tugged at our hearts with fresh music and honest dialog. The Pulitzer Prize Board, in their award to this show, praised this show as a powerful musical that “grapples with mental illness in a suburban family and expands the scope of subject matter for musicals”. For additional information about this and future productions, or about The Two of Us Productions please email us via www.TheTwoOfUsProductions.org or call the director at 518-329-6293. For advance ticket purchases please call 518-758-1648. 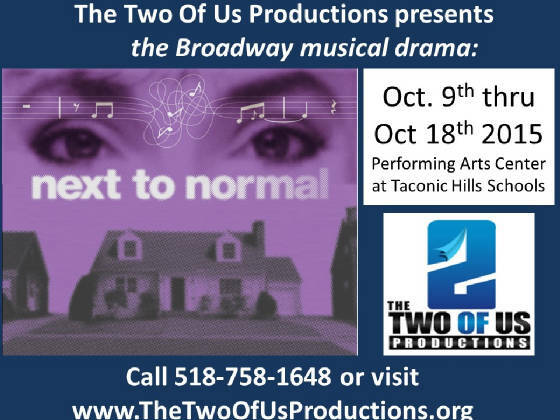 The Two Of Us Productions, the award winning theater company based in Columbia County NY, is proud to present the modern Broadway musical next to normal. With book by Tom Kitt, and music & lyrics by Brian Yorkey, next to normal is widely acclaimed for the sensitive and true to life telling of the Goodman family’s struggle to have a life that is “at least next to normal” while dealing with the after-effects of losing their first child. next to normal is being presented from October 9th to October 18th, 2015 in the well-equipped Performing Arts Center at Taconic Hills Schools, in nearby Craryville, NY. Next To Normal is widely acclaimed for the sensitive and true to life telling of the Goodman family’s struggle to have a life that is “at least next to normal” while dealing with the after-effects of losing their first child. The story of next to normal breaks new ground in musical theater by confronting its’ audience with not only the impact of a terrible loss, but also the emotional struggle of mental illness. This award winning musical has been lauded for its’ forthright portrayal of the symptoms of Diana’s illness, its’ impact on her husband and daughter, and the sincere but only partially successful efforts of modern medicine to achieve effective and lasting improvement. next to normal is also recognized for its’ fresh and innovative use of modern & classic music styles to carry the audience into the emotions as well as the thoughts of the actors. All in all a powerful musical drama that you will not want to miss! 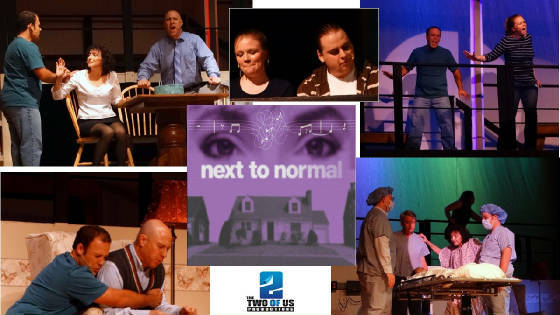 This new production of Next To Normal features Constance Lopez as Diana, Zachary Wobensmith as her husband Dan, Zach Nayer as her son Gabe, Betsy Rees as her daughter Natalie, Connor Anderson as Natalie’s boyfriend Henry, and Matthew Leinung as psychiatrist Dr. Madden. Constance was seen most recently in The Two Of Us Production’s full orchestra production of Jesus Christ Superstar. She has received critical praise for her portrayal of the anguished Judas in JC Superstar, the tortured Mme. Defarge in Tale Of Two Cities, and the wily MC in Cabaret. Zachary most recently appeared as Dan Goodman in a benefit concert of next to normal at the Laurie Beachman Theater in NYC and as Jonas Fogg in Sweeny Todd at the Piper Theatre. Betsy, Matt, Zach and Conor have all wowed their audiences on the region’s stages. Betsy most recently appeared in Jesus Christ Superstar as Mary Magdalene. Betsy & Connie both received 2015 TANYS awards for their great work in Jesus Christ Superstar. Conor, Zach & Matt wowed their audiences in Jesus Christ Superstar as well, Conor as one of the cabal of priests scheming against Jesus,, Zach as the firebrand Simon Zealotes, and Matt playing in the pit. Matt was last seen on stage in The Two Of Us Productions’ Into The Woods as one of the two charming princes. The Two of Us Productions is well known throughout the Hudson Valley for presenting quality theater, both musicals and dramas. Their recent productions of Les Miserables and Jesus Christ Superstar were both recognized by the Theatre Association of NY with multiple awards, including outstanding work by the company & outstanding performance by the orchestra. One of their trademarks is presenting musicals with full orchestras, a rarity that is a great treat for their audiences. They have performed at a variety of venues throughout the area including: Jesus Christ Superstar, Into The Woods, Spamalot & the NE regional premiere of Ragtime at the Performing Arts Center at Taconic Hills in Craryville, NY; the NE regional premieres of next to normal and Tale of Two Cities in Hudson, NY. Chicago at the BCC Boland Theater in Pittsfield, MA; Arthur Miller’s Broken Glass at the Valatie Community Theatre in Valatie, NY; The Owl and the Pussycat at the Cuneen-Hackett Theater in Poughkeepsie, NY; Cabaret and Christopher Durang’s Beyond Therapy at Stageworks/Hudson; John Pielmeier’s Agnes of God at The Lichtenstein Center for the Arts in Pittsfield, MA; and They’re Playing Our Song at the Rhinebeck Center for Performing Arts. next to normal is being presented at the well-equipped performing Arts Center at Taconic Hills Schools in Craryville, NY. Performances are 2 weekends only, October 9th, 10th, & 11th, and the following weekend of Oct. 16th, 17th, and 18th, 2015. Friday and Saturday performances are at 7:30pm and Sunday matinees are at 3pm. Tickets are $20 for adults, $14 for students & seniors, and $12 for groups & families. For advance reservations visit www.TheTwoOfUsProductions.org or call 1-866-811-4111 or 518-758-1648. For directions and parking please visit www.TheTwoOfUsProductions.org and click on the page for next to normal. Make your reservations early for the best seats on the date you want!